Quatchi Attends Boring Press Conferences! 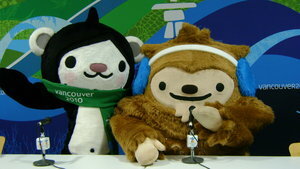 Being an Olympic mascot means lots of press conferences, like the one above last week at the Vancouver Art Gallery. 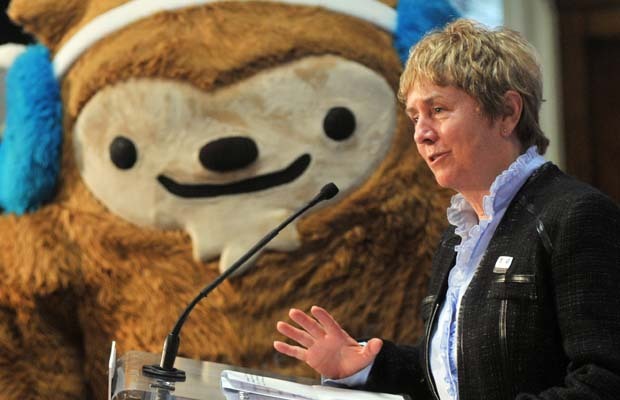 Quatchi spaces out while Canadian Senator Nancy Greene Raine goes on after being named Canada’s Olympic Ambassador, found here. 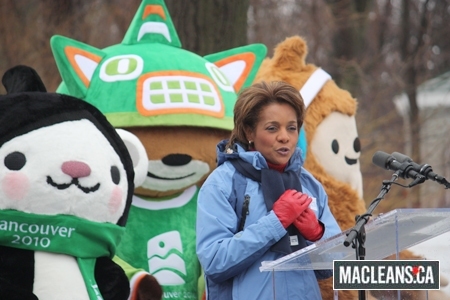 And found here are Quatchi and the gang with Canada’s Governor General Michaëlle Jean last February in Ottawa, at a ceremony unveiling the Olympic torch. In the video below, shot in Ottawa’s Canadian Parliament building, Quatchi and Miga get kicked off the stage! In all cases, he looks like he’d rather be playing hockey. Quatchi rocks the mic (found here). This entry was posted in Uncategorized and tagged Quatchi, update, video. Bookmark the permalink.